Edmonton Oilers prospect Ryan McLeod has his sights set on earning a roster spot right out of training camp. Selected in the second-round (40th overall) of this summer’s draft, even the most optimistic Oilers fan wouldn’t have thought McLeod could play in the NHL in 2018-19. McLeod has already stuck around longer than expected in his first NHL camp, though, and he doesn’t plan on booking a flight home to Mississauga anytime soon. Team insider and host of Oilers Now on 630 CHED in Edmonton, Bob Stauffer, tweeted on Sept. 17 that McLeod has an outside chance to make the Oilers this year. After the Oilers trimmed their roster down to 29 players (16 forwards, 10 defencemen and three goaltenders) on Sunday, McLeod, Kailer Yamamoto and Evan Bouchard are the only remaining prospects at camp. On the surface, McLeod deserves to get at least a couple regular season games with the Oilers based on his overall performance during the exhibition schedule. He has no goals and three assists in four preseason appearances with the orange and blue. At 6-foot-2 and 203-pounds, McLeod has a strong frame, elite speed, good hockey IQ and excellent passing skills. Although he is more known for his offensive acumen, he has a good understanding of positioning in the defensive zone. If McLeod, who turned 19 on Friday, can add some grit to his game, like his childhood hero and Oilers legend Ryan Smyth, then he could become a very effective third-line centre in the NHL for a decade or longer. Head Coach Todd McLellan told Oilers TV on Monday there’s a reason McLeod is still with the big club. “We have two junior eligible players left here,” said McLellan. “It’s getting later in camp, and their junior teams are starting. If we didn’t think these kids had a chance to play in the NHL, then we would have got them back with own clubs and got them ready to go. With Ryan Strome expected to miss the rest of the preseason due to a groin injury, there is a greater chance of McLeod traveling to Europe with the Oilers on Saturday. Moreover, McLeod has outperformed guys like Drake Caggiula, Kyle Brodziak, Pontus Aberg and Zack Kassian, all of whom should be on the Oilers 23-man roster this season. I could see the Oilers keeping McLeod, who has yet to sign an entry-level deal, until they return from Sweden and play a pair of games on the East coast. Then, send him back for his fourth and final season in the OHL, where he should dominate. 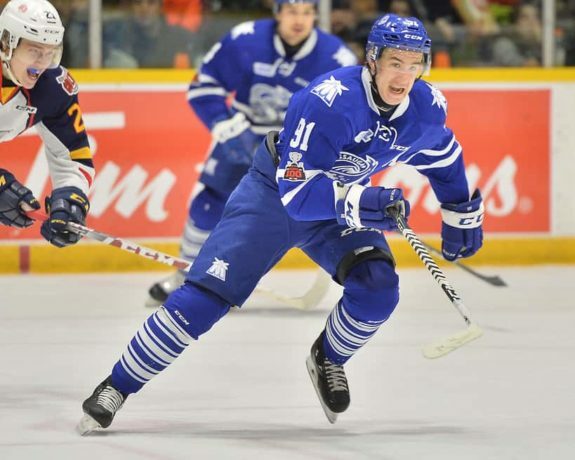 However, the Mississauga Steelheads, who are embarking on a full rebuild, are not an ideal place for McLeod to play this year. Fellow Oilers prospect Ostap Safin was traded from the Saint John Seadogs to Memorial Cup contenders and host Halifax Mooseheads, where he won’t have to carry the load offensively like he did in 2017-18. Safin could have played in the AHL this year, so if the Oilers were going to send him back to the QMJHL they wanted to make sure he was dealt to a strong club. The Oilers did the same thing with Leon Draisaitl in 2014-15, when they told the Prince Albert Raiders he would only be assigned to the WHL if they traded him to a contender. Draisaitl’s right were then sent to the Kelowna Rockets, who won the WHL championship and advanced to the Memorial Cup final. I think McLeod will be moved to a contender before the end of October as well. 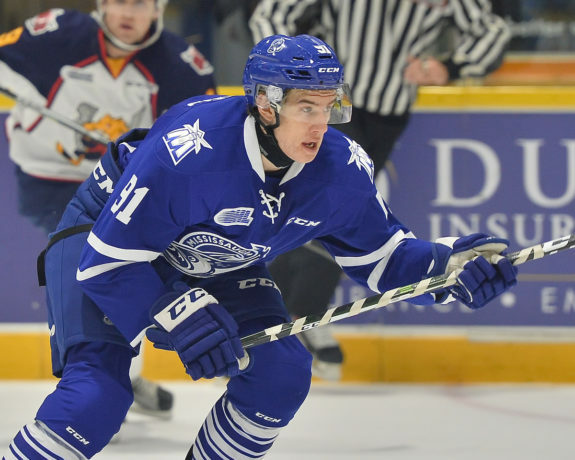 After scoring 70 points in 68 games with his hometown Steelheads in 2017-18, McLeod is primed to take another step forward this year and score 90 or more points, and there probably won’t be enough talent around him in Mississauga to help him achieve that. Another benefit to McLeod going back to the OHL is that he should have a great shot to make Team Canada at the 2019 IIHF World Junior Championship. McLeod could get a taste of the NHL this year, but he’s still likely a year away from securing a permanent spot in Edmonton.